With innovative producs, we present you the right solution for almost every filtration area. The development and production of high-quality filter systems, elements and spare parts has been the core competence of Fil-Tec Filter GmbH for many years. 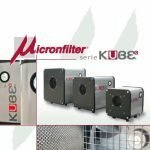 In the incredibly compact and carefully curved KUBE body, the Micronfilter designers have cleverly inserted 4 stages of filtration with progressive efficiency. The backwardly curved impeller blades (2), specifically designed to generate a powerful coalescent effect, but primarily conceived for avoiding along all the mist collector life, any phenomenon of imbalace and subsequent, vibration, silently conveys the air flow inside to the mist collector. The SPIN series central coolant filters are Micronfilter’s response to “GREEN Technology” focusing on a SELF-CLEANING DRUM style coolant filter. The SPIN has been designed for filtering large volumes of coolants or other liquids, without generating any disposable filter media. IFA-BGIA Certification (DIN EN 60335-2 directive) classification “M”.